Lofty and warm, with extended coverage and an insulated hood, the Thorium SV Hoody is created for effective warmth in frigid conditions. Premium 750-fill European grey goose down delivers exceptional warmth for its weight, is durably resilient, and packs easily. As it is designed to function as standalone, not a midlayer, the Thorium SV is built using box wall construction to deliver maximum loft. The outer is soft, durable Arato 40 nylon, a lightweight material that withstands abrasion, packs compactly and has a DWR finish to repel moisture. 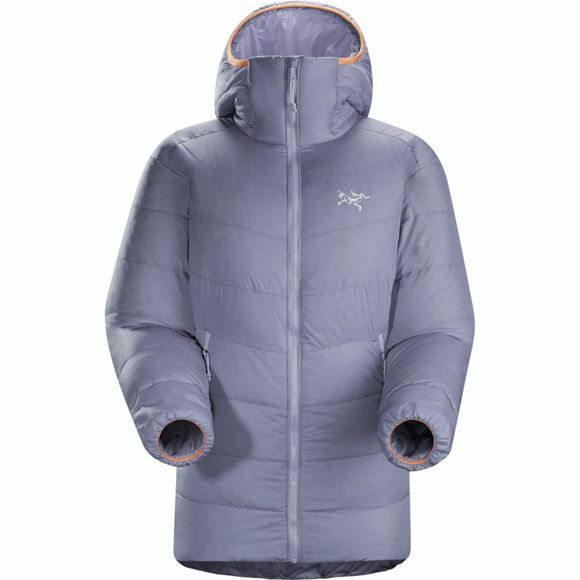 Arc'teryx Down Composite Mapping technology combines the goose down insulation with panels of Coreloft synthetic insulation in areas prone to moisture. Used in the hood, cuffs and under the arms, the Coreloft insulates even if wet. Down is used in the sleeves and around the body's core. The lower thigh length cut adds coverage, and head protection comes from the insulated StormHood. The hood's unique design is low profile, yet helmet compatible, and adjusts for a secure, ergonomic fit with superior peripheral vision. The unique No Slip Zip combines the security of a locking slider with the ease of a nonlocking quick release system. Purposeful design is an Arc'teryx commitment. When designing for women, each element is refined to specifically to meet the needs and demands of the female athlete, with consideration for their specific needs. The Thorium SV's Athletic fit is streamlined but leaves room for layers. Articulation built into the sleeves and gussets under the arm provide a level of freedom of movement not often found in an insulated jacket.